Civil Bank Limited, Class “A” Commercial Bank of Nepal, requires pool of competent Human Resources for its sustainable growth objectives to be achieved through controlled aggression and seeks applications for the following positions from competent Nepalese candidates with excellent interpersonal skills, high professional standards and integrity for its upcoming Branches at Arjundhara, Shani Arjun (Jhapa), Surunga (Jhapa), Rabi Miklajung (Panchthar),Urlabari (Morang), Dhalkebar, Mithila (Dhanusha), Dudhe, Shivasatakshi (Jhapa), Lahan (Siraha), Dhangadhimai (Siraha), Golbazar (Siraha), Garuda (Rautahat), Kalaiya (Bara), Mahagadhimai (Bara), Thakurbaba (Bardiya), Lalmatiya (Dang), Sitalbazar (Bardiya), Darche (Gorkha), Birendranagar (Surkhet), Chhinchu (Surkhet), Bhajani (Kailali), Lamkichuha (Kailali), Duhabi (Morang), Jitpur (Bara), Kohalpur (Banke), Bhadrapur (Jhapa), Chandrapur (Rautahat), Nijgadh (Bara), Lamahi (Dang), Damauli (Tanahun), Malangwa (Sarlahi), Biblyate (Ilam), Dharan (Sunsari), Puspalal Chowk (Morang), Lamachaur, Pokhara (Kaski), Shiva Chowk, Pokhara Kaski). At least 3 years of banking experience in Credit Sales and Operations. Candidates need to be acquainted with overall credit sales and operational functions of the bank and have the ability to lead diverse team effectively, demonstrate strong sense of work ethics, and have strong drive with a demonstrated willingness to take on challenging sales targets. Note: The applicant must be presently working at the same level or one level below the position applied for. 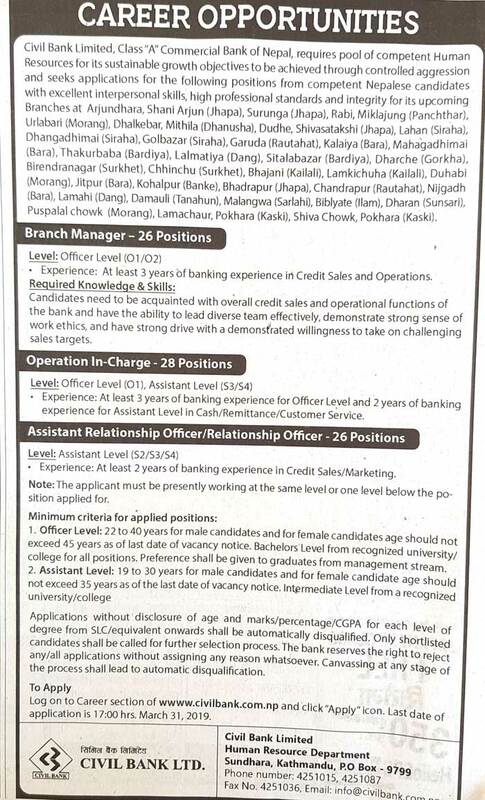 At least 3 years of banking experience for Officer Level and 2 years of banking experience for Assistant Level in Cash/Remittance/Customer Service. At least 2 years of banking experience in Credit Sales/Marketing. Applications without disclosure of age and marks/percentage/CGPA for each level of degree from SLC/equivalent onwards shall be automatically disqualified. Only shortlisted candidates shall be called for further selection process. The bank reserves the right to reject any/all applications without assigning any reason whatsoever. Canvassing at any stage of the process shall lead to automatic disqualification. Log on to Career section of wwww.civilbank.com.np and click “Apply” icon. Last date of application is 17:00 hrs, March 31, 2019.